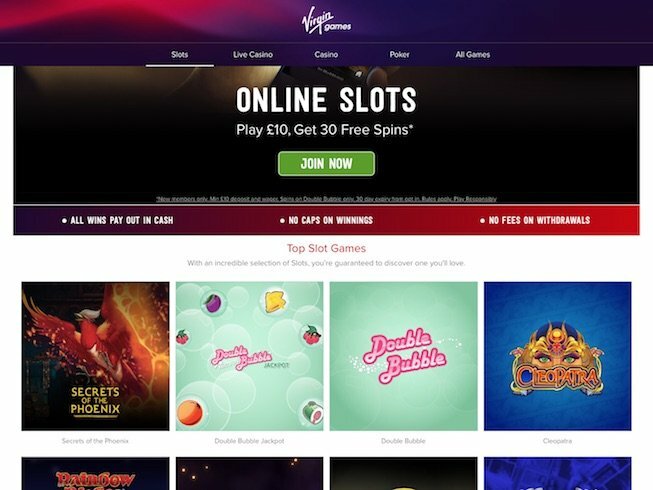 We couldn’t compile a comprehensive list of UK online casino reviews without including one on Virgin Games. The Virgin brand is synonymous with lots of things, but if you haven’t yet visited their gaming site, we think it’s worth your while to do so. Nintendo looking pixelated 90’s spin-off from NetEnt offers an incredible 3,125 ways to win! Sometimes you land on a gaming website and you’re impressed with what you see, even before you explore in more detail. That’s the case at Virgin Games, which provides an extensive selection of games designed to keep everyone happy. The home page is quite simple and a quick scroll reveals more about the welcome bonus, the daily free game opportunity and their VIP programme. But as you’ll see, it’s when you get to the games part of the site that the fun really begins. The games section is easy enough to find when you land on the www.virgingames.com home page. Click on games in the menu and you’re taken straight there. Most sections offer plenty of choices, but even the ones where you only get a couple (i.e. the instants section only had three games at the time of writing) are worth visiting. If you are new to the site and you want to see how the games work, you can click the demo option to check them out. Your chosen game will load in a second screen. You can switch to real play at any time, but demo play doesn’t require an account or a login to work. Another feature we liked is very easy to overlook. Above the demo and play buttons is a small link to game info. This reveals everything you could want to know about a game prior to playing it. It gives you a handy box with info including paylines, coin sizes and the top payout available. It then gives you instructions on how that game is played. This is ideal if you’re new to Virgin Games or indeed online gaming in general. New slots at Virgin Games Casino in 2017 include Warlords Crystals of Power, Double Bubble, Queen of the Tree Folk and Jack and the Beanstalk. If you head into the casino, you’ll see there are plenty of game choices here as well. There are different versions of roulette, blackjack poker and all kinds of other options too. The information given on the Virgin Games online site is quite impressive, and it does set it apart from its competition. Look at the foot of any page and you’ll see the site is copyrighted to The Gamesys Group. That’s the software provided for the platform, and it gives you access to a superb range of games, as we’ve already seen. It’s particularly noteworthy to see some exclusive games available via the platform. There were six available when we visited, including three slots and three casino games. It gives you a reason to visit Virgin Games instead of going elsewhere. The mobile site is particularly good and highly responsive, read the virgin mobile games review here. Good banking facilities are important on any gaming site. In fact, we would count them among the most important facilities of all. You’ve got virtually everything you could want here, including Visa, Visa Debit, MasterCard and Maestro. The online options haven’t been forgotten either, with Skrill, Moneybookers, Neteller and paysafecard among those options. Now, we all know questions may eventually pop up when you are on any online gaming website. When you’re on the Virgin site, look for the ‘need a hand?’ link to the right of the menu at the top of the site. This opens the support home page in another page, so you won’t lose where you were before. As you hover your cursor over any of these, more options will appear. Underneath those sections, you can also explore popular questions and troubleshooting options. And as if that wasn’t enough, you can also click the contact area to find out how to get in touch. This can be done via a live chat conversation (just complete the form) or you can use the phone or email options instead. Does Virgin Games rank as one of the best UK casinos you could visit? We think it does. Our one bugbear was the rapidly-scrolling banner near the top of the home page, but we’re assuming this was a technical glitch when we visited. Once you’re off that page and exploring the site, you’ll find it to be user-friendly and very tempting to join. Will you? We think you might when you realise how much the gaming site can share with you, and how well-designed it is too.